Winner is a relatively new offering operating since 2010 from Redfinger Trading. They h ave produced a specialist sports betting app with the Winner.com sports app. New customers to the winner.com mobile sports app can go from the links on this page and pick up a £50 new account bonus. Below is a guide to how to: download the Winner.com mobile sports app, claim the free bets on offer, and browse through the features on this mobile site. The Winner.com Mobile Sports App only deals with Sports Betting. And whilst it can be used on any mobile, you can also use it equally as well on a computer, as this gets detected automatically. The way in which you add a home screen link is dependent on what sort of device you have. 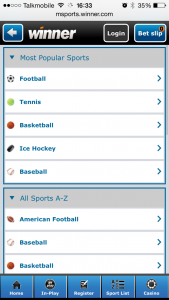 It means creating a short-cut icon that enables you to access the Winner.com Mobile Sports App from the home screen. For example, if you use an iPhone or iPad you may be familiar with the ‘Send To‘ and ‘Add to Home Screen‘ graphics that look like those on the right. Use these to create the home screen link to the Winner.com mobile sports app. For Android devices this is achieved by similar steps. 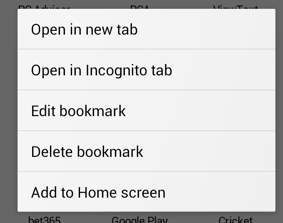 In the browser screen, tap the menu button and go to Settings >Star >Bookmarks >Save. Next, go back to Settings > Bookmarks. The Winner.com sports app app is now a bookmark, press and hold your finger on it. Then, a new menu pops up (see image to the left). Tap on ‘Add to Home screen‘ and you will be done. On a recent BlackBerry device, making a home screen link can be achieved by pressing on the menu icon and selecting “Add to Home Screen” from the options. Then, press Save after you have named the shortcut. After finishing the initial setup, next time you visit the home screen there will be is a Winner.com Sports App icon there. This is a shortcut to the mobile site app. That is all that needs to be done to set up this mobile site app. There isn’t an installable app and that’s no bad thing. Installable apps have a tendency to crash and they also take up valuable space on your mobile device or computer. With a mobile site all you need to do is tap on the new home screen icon on any device. If things ever get stuck just refresh the screen. Taking a tour around the basics of the Winner.com Sports App now and all is clearly laid out on the main menu. It’s really important to have an easy to use design and refreshingly, this app has just that. The app is all about sports betting and you’ll find the range of options plentiful. Our review team were satisfied with the way that the Winner.com mobile sports app worked on the mobile devices used to run tests. The mobile version is similar in functionality whether using iPhone, iPad, Android smart phone, Android tablet or BlackBerry. In addition to working out which kind of device is being used and then adapting to the appropriate screen size, the interface is simple and easy to navigate. Sports are sorted by a ‘Most Popular Sports’ menu which includes: Football (the round ball type), Tennis, Basketball, Ice Hockey and Baseball. Below this you can find an A-Z of all sports. The listing of all sports is as follows: American Football, Athletics, Australian Rules Football, Baseball, Boxing, Cricket, Cycling, Darts, Entertainment, Football, Golf, Greyhounds, Handball, Horse Racing, Ice Hockey, MMA, Motor Sport, Politics, Rugby Union, Snooker, Tennis and Volleyball. Once you go into the particular sports menu’s next level it breaks things down by country, then league. From here you can get the odds, which can be set to either fractional or decimal. 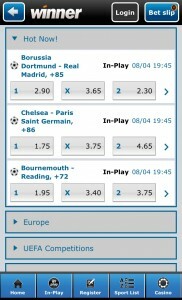 Once you make a selection it is added to your bet slip which is located in the top right hand corner. When you tap on this it shows you your bet selections in the bet slip and from here you can enter your stake then place the bet/s. On the desktop version of the Winner.com mobile sports app you can listen to a selection of sports radio stations which can be a great way of keeping in touch with what’s happening live around the different events as well as getting breaking news. 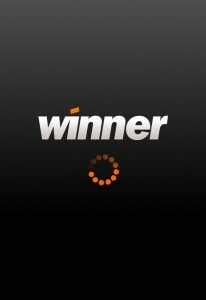 Languages available on the Winner.com mobile sports app are English, Finnish, German, Greek, Russian, Spanish and Swedish. Currencies accepted are AUD, CHF, DKK, EUR, GBP, NOK, SEK, USD and ZAR. Now to the details of the free bet offer. When you open an account with Winner Sport and deposit & bet £5 or more they will give you free bets of the same value up to a maximum of £50 / € 50. Terms are that your qualifying bets must be placed on a selection/s with odds greater than 1.5 (1/2). Only the win parts of each-way bets qualify. Your Free Bets will be credited once the qualifying bet/s has been settled. New account holders to the Winner.com Mobile Sports App can then use this matched bet on the range of sports as described above. Sometimes there are even more options available on the desktop version so also take a look at this when you get you your home computer. Winner provides a live support service offering 24×7 should you need to get in touch with a person with a query or problem. Because it is a mobile site, when used on your mobile device, the app identifies your phone/tablet and alters the display to make it look best for you. It also works on the big screens of PCs and Macs big screens too and you see more options due to the increased real estate. As touched on previously in this review, the Winner.com Mobile Sports App has a simple interface that makes the Winner.com Mobile Sports App clean, easy and fast across any device you choose to use. To odd comparisons, and the Winner.com Mobile Sports App comes out well here. Market-leading odds are not unusual and that applies to a wide range of odds that we reviewed. We’ve mentioned that Winner.com Mobile Sports App is all about sports but it has a link to casino games in the bottom right hand corner. That in fact takes you to a different mobile site where you can take part in a range of games that we don’t cover in this review. Please note that the information presented here is accurate at the time of this review of the Winner.com mobile sports app and could change from time to time. We will revisit both the Winner.com Mobile Sports App and Winner.com web site periodically and update this review so it should remain relatively up to date. Winner.com was established in 2010 and is owned by RedFinger Trading Limited which is based in Cyprus. Redfinger Trading launched Winner Casino in 2009 which offers Poker, Games, Bingo and Mobile in addition to this sportsbook. The winner.com mobile sports app site is powered by Playtech software, a platform that leads the field in casino and is now established in sports betting. Customers have the reassurance of Playtech’s long trusted and secure technology providing an extensive range of sports betting markets, including full coverage of UK horse racing. That wraps up this Winner.com Sports App review. You might also want to take a look at the rest of the apps who made the best mobile betting app shortlist. For another list of the best football betting sites, try the Sports-Index (opens new window).